A top layer from VISCOELASTIC FOAM, whose properties allow it to respond to pressure and heat is able to conform to shape of the human body. The VISCOELASTIC FOAM softens under the influence of the body heat of the user, leading to even distribution of weight and to a reduction in pressure, all having a positive effect on the organism. Therefore, there is no interruption of blood circulation and no possibility of developing a bed sores. The muscles are fully relaxed while you sleep, helping the overall relaxation of the organism. The natural Biogreen foam in the core of the mattress is made on a base of castor oil with added Aloe Vera, which increases the hygiene properties of the mattress by destroying mites and bacteria and brings a piece of nature into your bedroom. The core of the mattress is profiled in such a way as to provide support in all seven zones. 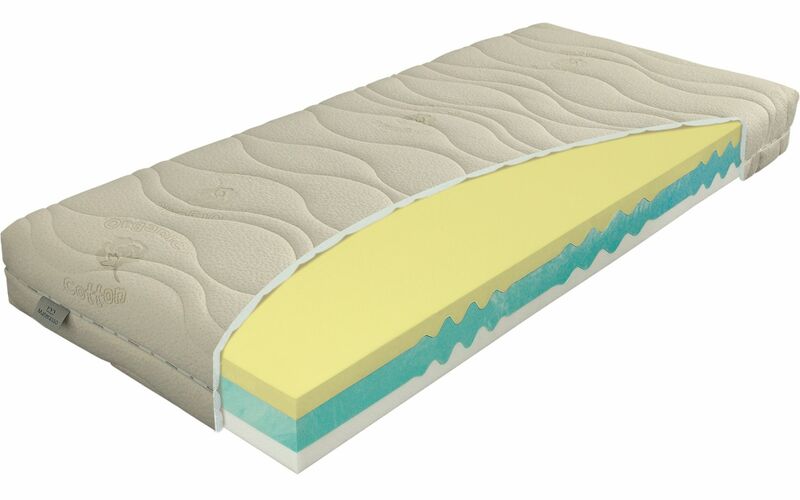 Another layer of the mattress comes in the form of latex, foam that is made of natural rubber. It has become the standard-bearer for the development of HR (cold) foams as a result of its excellent elasticity, and above all its ability to maintain this property for many years. The outstanding orthopaedic properties of latex foam best come to the fore in combination with a slatted bed base (minimum 26 slats).